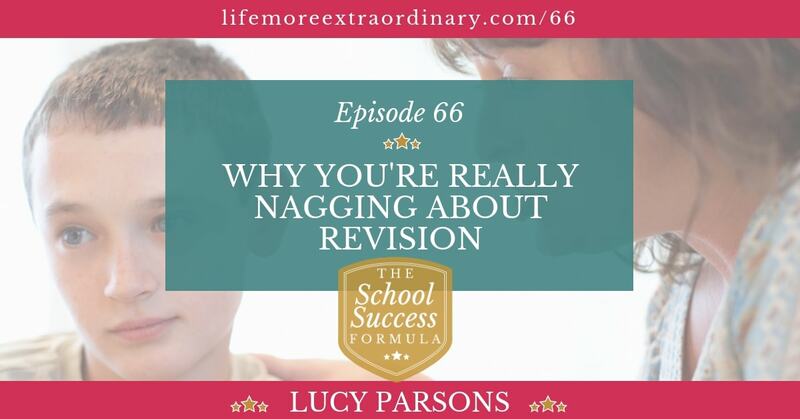 Do you find yourself constantly nagging your children about revision? Do you hate yourself for it? 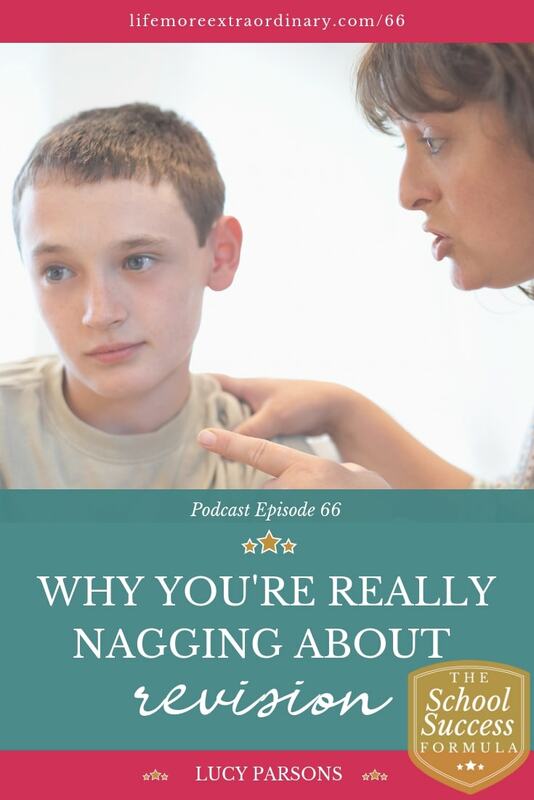 Can you see the damage that the nagging is doing to your relationship with your child, but you just can't seem to find a way through it? In this article, I'm going to explain why you're nagging and how I can help you get over it. When our children are in primary school we create time and space for them to do their homework. I'm still doing this with my six-year-old son. We need to tell him that it's time to do his reading or spellings and scaffold him to do the project-type tasks that school sets – sitting with him and directing him throughout the task. As our children get older they take on more independence. My daughter is eight and I'm led to believe that she's quite unusual in her levels of motivation and commitment to her school work. She has now taken on complete responsibility for all of her homework – her choice, not ours. She just takes it off to her bedroom, or asks if she can borrow my computer, and gets it done. This independent stage will emerge at varying times depending on things like your child's academic abilities, their interest in their school work and their desire to do well. The problem is that when students get to secondary school there are often up to three years when both teachers and parents kind of let homework routines drift. These are years 7-9. Not much homework is set during this time and the consequences of not doing it aren't that heinous – so the unmotivated do their best to get away with doing as little as possible. At the same time, parents are stepping away from that supervisory role, believing that their children are old enough to take on responsibility for their homework. You're probably keen to get some time back, do your own thing and generally reclaim aspects of your own life that you've lost to parenting since your child was born. This is definitely true in some cases, but not all. In his world-famous self-help book, The 7 Habits of Highly Effective People, Stephen R. Covey has a section on delegation. For some reason, this is the part of his book that has stuck with me the most – maybe because he uses the example of delegating cutting the grass to his teenager as an example. Gofer delegation – this is highly directive and prescriptive delegation where the person in charge stipulates exactly how and when to do every stage of a process. This is really disempowering for the person who is being delegated to and gives them no ownership over the process. It also means that the person delegating doesn't actually get any freedom – they always have to be there, directing how something is done. This is a bit like me with my six-year-old at the moment. Stewardship delegation – this is where you say to someone, ‘I'm handing over responsibility for this job to you. These are the outcomes I want to see, but I'm leaving it up to you how and when you do the work to achieve those outcomes'. You want your son or daughter to be operating under the stewardship model. How do you get your child to take on stewardship for their school work? Working through the list it became apparent that there was about 60 hours worth of tasks every week for Covey and his wife to take care of in the home and this wasn't going to be sustainable. The children realised that and started taking an interest in some of the jobs. Covey's son volunteered to look after the ‘yard' (garden to us Brits). Covey knew that if his son was going to do a good enough job of looking after the yard he'd need some training. Covey then gave some tips to his son about how to keep the yard green and clean. Before they finished Covey said that he'd check how things were going in two weeks time. He made it clear that he would be the judge and that his criteria for success was whether the yard was green and clean. The rest was up to his son. Unsurprisingly, the job wasn't done to Covey's satisfaction at the two-week check-in. But, he talked to his son about why he hadn't achieved what had been asked of him and gave him another chance and another check-in point. Eventually, Covey's son fully took on responsibility for the yard – he had stewardship over it – and everyone was happy. What's this got to do with revision? And, I think it's here that a lot of parents come unstuck. You know that your child should be revising and you've got an idea about how you did it back in the day. But, you can't find a way to get them to the point where they are able to take stewardship for their revision. Basically, I'll guide you and your child through the process so that you, as a parent, can move from the Gofer, nagging style of delegation that drives everyone involved around the bend, to the stewardship style of delegation where you feel relaxed and calm because you've set your expectations and know that your child has the tools and skills to study in a way that works for them. We start the next round of The Exam Success Formula on 26th January 2019. Join The Extraordinaries Club to take part, and finally stop nagging.